The deadline for application has already expired, but we still have a few places left. If you are interested in applying, get in touch with us as soon as possible! The Film Production programme is a two semester intensive full-time course. During the two semesters you study script writing, directing, cinematography, film production, sound and editing, through practical exercises as well as seminars and lectures. The aim of the Film Production Programme is to foster creators of narrative film with international potential. The aim of the Film Production Programme is to foster creators of narrative film with international potential. It is a course for you who has the passion for film as a form of expression. You are itching to explore your creativity. We are geared towards those of you who have a strong commitment and an urge to develop. 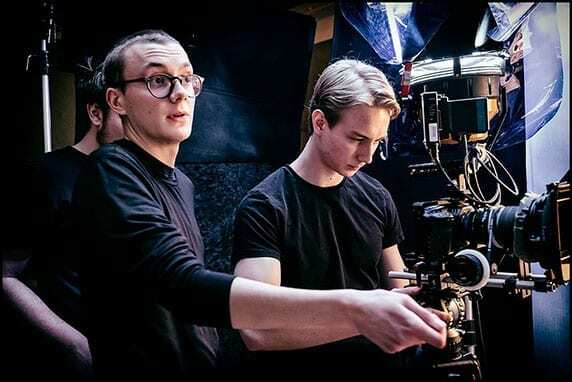 Students of the Film Production programme have the opportunity to work with highly professional equipment and be mentored by a variety of professional filmmakers as well as producers. The school facilities provides students with an ideal creative environment for making and analysing movies. The doors of Stockholms Filmskola is open to everyone with a serious interest in pursuing career in the film industry. The Film Production programme is an intensive two semester course. During two semesters you study script writing, directing, cinematography, film production, sound and editing, through practical exercises as well as seminars and lectures. You learn the basics of the complex profession of the film producer. As a director you learn to process a text and analyse the characters. You participate in workshops with actors while practicing directing and you train in how to pitch your ideas. As a cinematographer you will become familiar with different kind of professional camera equipment and learn about lighting in different environment. You get to make films in a studio, on location, and outdoors. We always work creatively in small production teams of 5-7 students. 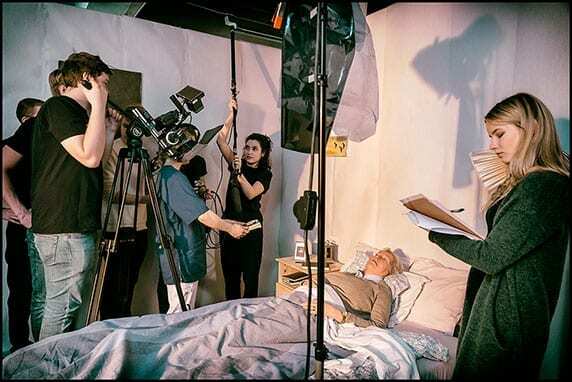 The studies at the Film Production programme is 80% practical. The applicant will be invited for Skype interview within approximate a week after successfull application has been handed in to Stockholms Filmskola. From that the successfull applicant receive the admission letter s/he has 7 days to accept or decline the offer. A non refundable application fee of 50€ must be received at the time of application in order of the admission application to be processed. Students should pay the first instalment of their tuition cost of 800€ within 7 days from the date they have been offered a place and have accepted their offer. The second instalment of 11,200€ has to be paid before the beginning of the school year and no later than 5 August. For further information please scroll down terms & conditions. The International Film Programme is not covered by CSN – Swedish Board of Student Finance. Stockholms Filmskola does not offer scholarships for international students. Welcome to visit Stockholm Film School! During Open House you’ll have the opportunity to watch movies made by our students, get a tour of the school and take a peek on how students work ‘on set’. Teachers and students will be here to answer your questions. Film Production is taught in English. It is not covered by CSN – Swedish Board of Student Finance. The deadline for the application has already expired. We still have a few places left. If you are interested in applying, please get in touch with us as soon as possible! Please get in touch if you have any questions regarding the programme or the application. "I had no contacts in the film industry whatsoever, and knew next to nothing about filmmaking when I started Stockholm Film School. Here I stepped into a world where everyone talked about, and made film. The teachers were dedicated professional filmmakers. I learned all the basics, and since we shot on celluloid a lesson learned was the importance of planning and making well-calculated decisions. Apart from that I met many film mates, and we still hang ot together." "I really liked the education, and the life at Stockholm Film School! When I graduated high school I felt that this is a place where everyone was so dedicated and filled with the will to make film. I already knew I wanted to be a cinematographer, and shot a lot since most of the others wanted to direct. When I finished Stockholm Film School I knew a lot about film which I first discovered while working as an assistant. I learned the basics well. If you learn what a film shoot entails, and understand what is demanded of an assistant then you will get a job. I meet many people in the film industry who are former students from Stockholm Film School." "Stockholm Film School gave me an invaluable foundation to stand on, and the possibility to make mistakes, test stuff and work as much as I wanted and needed. This was a good headstart into the film business, and gave a lot to those who wanted. I have always desired an overview and to stand in the background, so after finishing Stockholm Film School I started my own company with myself as a producer together with a classmate. We at once had great opportunities to grow in the music video industry, within little time we had worked with big artists and today, a few years later I am an investment consultant in film, and executive producer between Stockholm and Los Angeles." "At Stockholm Film School I discovered what I wanted to do. There I had the opportunity to try out different functions within filmmaking, and to meet professionals. I realized my greatest interest lies in following a story from the beginning to the end. That is why I applied - and was accepted - to the Film Production education at The Stockholm Academy of the Arts." ”I knew I wanted to make film, but not exactly in what capacity, so it was great to learn all the different functions and the whole work process. I got a job as editor after the Film School. Today I am the CEO of a post production company and I have enormous use of knowing film production on all levels. It creates trust with my customers and I can be both supportive and make better decisions. At school I met many cool film mates with whom I am still in contact." "I had fun at Stockholm Film School. But first and foremost, I had wonderful teachers who were professional, industrially-trained artists, who shared everything they had from the industry's knowledge with us. 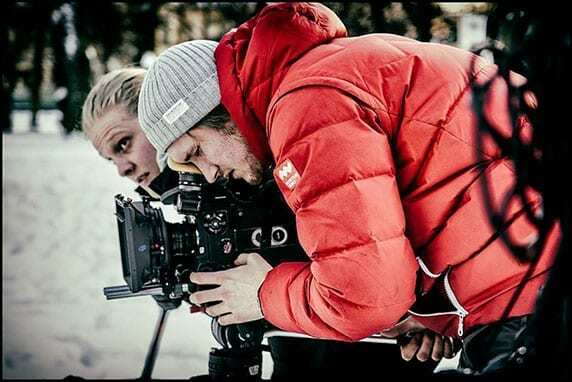 Directing teacher Moberg and photographer-teacher Holmberg constantly tested our abilities and made me aware of how to work with actors, as well as all the technical and visual needs of learning about a camera. " The cost of living is approximate 7,600€ / year. This is excluded rental and private health insurance. Non-EU students need to apply for student visa. Click here for information about how to apply for student visa. EU/EEA/Swiss citizens -you should register for a European Health Insurance Card (EHIC) in your home country before coming to Sweden. This card gives you the right to medical care at the same cost as Swedes. Non-EU/EEA citizens: stays of less than one year – If you have a residence permit valid for a period of less than a year, you won’t have access to the public health insurance. Students who aren’t covered by the public health insurance must arrange for their own insurance coverage, as medical treatment can be very expensive without any form of insurance. It’s highly recommended to arrange for health insurance from your home country so that you’re covered during your trip to Sweden and as soon as you arrive. Please be advised that Stockholm Film School do not have a campus. The average price range for rooms are 280€ to 850€ a month depending of the distance to Stockholm city centre. 2. Ask the landlord for their personal id when signing the contract to validate their information (they will do the same with you so don’t be shy). The school year is divided in autumn- and spring terms/semesters. Application to participate in the film school’s autumn and spring courses shall be done in this application form and be provided to the school at the given date of deadline which can be found on the homepage. Applicants who are admitted to the school are informed by e-mail to the adress submitted in the application. Together with the admission notification, the applicant’s application fee is also invoiced. At the latest 7 days after receiving the admission notification the admission fee of 800€ must be paid to the school’s bank account. When the admission fee has reached the school admission is definite. If the admission fee is not paid on time the admission is rendered void, and the ensuing vacancy is filled by another applicant. The total tuition fee for the international course per school year is 12.000 €. In order to accept the offer and secure your place at Stockholm Films School it is necessary to pay the fees and charges due as indicated in the Letter of Offer. A non refundable application fee of 50€ must be received at the time of application in order of the admission application to be processed. Students should pay the first instalment of their tuition cost of 800€ within 7 days from the date they have been offered a place and have accepted their offer. The second instalment of 11,200€ has to be paid before the beginning of the school year and no later than 5 August. When nonpayment according to invoice occurs, statutory fees will be added. If an applicant who has been accepted to the school and paid the first instalment decides, of any reason, not to start the course, the film school must be notified in writing by e-mail as soon as possible, at the very latest on 10 July or s/he is obliged to pay the remaining tuition fee of 11,200€ according with the sent invoices. The first instalment of 800€ is non-refundable.